So it is that every cameras system has a particular register or flange focal distance -- all lenses for the system must be made to that exact specification. The register is measured from the sensor plane to the mounting flange on the rear of the lens. It follows that a lens designed for one camera system might be adapted to mount on a body from a different system so long as a) the correct physical couplings (screw mount or bayonet mount) are adapted, b) the register is matched. If the lens was originally designed to be further from the sensor, the adapter can make up the missing distance. But there is little that can be done if the lens needs to be closer to the sensor than the camera can physically accommodate. Thus, when looking at lenses to adapt to a given body, we need those designed for longer registers. And the corollary of this is that cameras with short registers can accept the widest variety of existing lenses. And this is exactly the position we find ourselves in with today's ILM digital cameras. Adapters exist to mount dozens of different legacy lens systems on Sony NEX or Micro-Four-Thirds cameras. I should mention in passing that as well as register and physical coupling, a modern lens mount provides electronic couplings. In this way the camera body can communicate with the lens and learn certain qualities (e.g. focal length and current aperture) of the lens. Unfortunately, we can assume that when adapting lenses to our ILM camera, all such electronic coupling will be lost. Given that we are spoilt for choice, which lenses should we use? One way to decide is to see which lenses you already own. Since I have lots of K-mount lenses for the Pentax DSLR system, my first adapter was K to MFT. 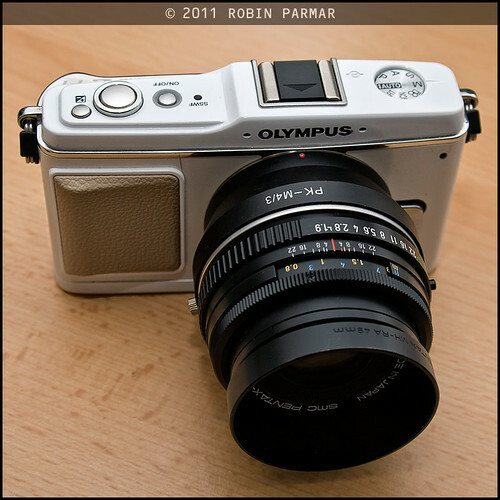 I have already shown examples of the Olympus E-P1 with the superb FA 43 Limited, and have had good success with every Pentax lens I've tried -- M42 mount lenses as well. Using these adapted Pentax lenses is a piece of cake, since stop-down metering is automatic and the camera meters through the lens perfectly. All I need to do is pick an f-stop on the aperture dial and focus. Nothing could be easier. The feel of using these great solid metal lenses far out-classes the auto-focus mushiness of those Olympus and Panasonic have themselves built for the system. One problem remains in adapting SLR lenses to the ILM camera. The adapter has to be quite large to make up the register difference, as you can see from the picture at the top of this article. This limits the advantage of the compact size of the system, one of the main reasons to choose it over a DSLR in the first place. Perhaps instead we should be looking for lenses already designed for short registers? That is precisely what I will consider in my next article. I will list the possible choices and narrow the range by applying my criteria of price, size and usability. See you then!